I took today’s photo before 11 am. Did other things for the next hour and a half or so. Tried to upload the photo to my blog’s media folder. I walked away to give the computer time to catch up. I put my laundry in the dryer. I returned to the computer. Tried to upload the photo to my blog’s media folder. Figured I’d write a nice post without a photo. No biggie, even for a blogger trying to post a photo-a-day during Lent. Edited previously written draft of post. Saved Draft. Was asked for my username and password. Signed back in to site. Lost previous tweaking of aforementioned blog draft. Jim walked in about then and said he thought I should blog about making almond butter tonight. I made almond butter tonight in the Vita-Mix. It took me less than 2 minutes. No joke. The almond butter is awesome. Maybe I should make almond butter more often and try to upload photos to my media folder less often. Then again, I still have to clean the Vita-Mix. A photo a day during Advent, perhaps a brief reflection a day. Reflecting, visually and verbally, on an Advent scripture passage, or on a general Advent theme. Sounds simple enough, right? Right. I’ve done this for several years now, as have a few friends. But this year I’m doing it a bit differently. I’m going to reflect on an upcoming Sunday’s scripture, rather than on a Sunday that has passed. The only problem is, Advent began 16 minutes ago (as I write this). I’m already behind! I was going to start this past week, reflecting on tomorrow’s Scripture passages. I was going to enter the 2010 season of Advent more reflective, more mindful of God and God’s word. I was going to enter this season feeling ready. Not behind. At least not with this one piece of my life. I did begin taking photos on Thanksgiving day. So I’ll post those in a bit. And today, the first Sunday of Advent, will simply have several posts. Posts with good intentions. Ready or not, Advent is here. Sometimes I can hardly stand it..
how cute she is. And how funny. I wish I had the energy to write the stories, right now, but for now, photos will have to do. Enjoy. carrying the hockey stick--in its bag. She carried it around much of the time we were outside playing that day. We love spring! We love chalk, spray bottles with water, being outside in the spring... and, by the way, the chalk rainbows down the driveway were on request by Kajsa, but exectued by me, on rollerblades. Lily of the Valley--this ones for you, Joan! “O give thanks to the Lord, for he is good; his steadfast love endures forever.” (Psalm 118:1) .. it’s easy to give thanks to God when looking at a gorgeous moon, a beautiful cross on a beautiful church.. It’s easy to remember God’s steadfast love… to feel God’s steadfast love. I love this view. The photo, not so much–but you know how I feel about my camera being in the shop. Still, I love the view. 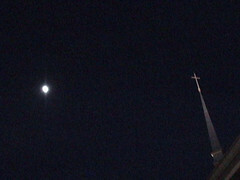 I love walking the grounds of the church at night, with Abby… and looking up. The challenge is to look “up” throughout the day. Not only when the beautiful cross and moon are noticeable, but all the time. To look up at the cross, to look to God for guidance… to give thanks at all times.. to remember the steadfast love of God…. at all times. a "bridge" in the woods behind our house... and wearing her boots for the "gooey mud". playing with beans... pouring beans into her plastic cups and bowls, then pouring them back into the big bowl.